Consultant’s Guide to SAP SRM is written by two very experienced SAP SRM consultants Padma Prasad Munirathinam (Prasad) and Ramakrishna Potluri (Ramki). The book is an implementation guide for SAP SRM implementation consultants. Procurement function is going thru transformation in most organization today and it will be a key driver for profitable growth in future. Until very recently, most organizations looked at procurement as tactical function, but perception has changed. It is getting strategic focus today. As organizations look to transform procure to pay cycle, a good enterprise software such as SAP’s Supplier relationship management will be the key driver. Consultant’s Guide to SAP SRM can help implement SAP SRM based solutions. Prasad and Ramki start with introduction of purchasing function, procurement models and factors affecting procurement in organizations today. They then covers brief overview of SAP SRM capabilities and modules. In next few chapters, Authors cover scenarios offered by SAP SRM – Classic, Extended Classic, Standalone and Decoupled scenario. These scenarios are explained in detail with differences and benefits offered by each scenario. Technical details and configurations are covered covering basic setup to advanced capabilities. Prasad and Ramki use case studies throughout the book to explain the concepts and scenarios. 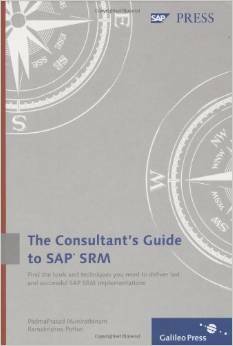 Consultant's Guide to SAP SRM can help new consultants get up to speed with functionalities of SAP SRM. The book also provides step by step configurations to achieve desired business processes. The book is aimed at new and existing SAP SRM consultants, SAP SRM Project team members, and business users. The book starts extremely well. Authors provide excellent coverage to procurement function, how it has evolved and trends affecting it. Trends such as Category management, Employee self-service, and supplier engagement will bring value to procurement function. But then the book restricts the procurement trends to only the capabilities of SAP SRM, which creates somewhat bias towards SAP SRM. For example, Supplier network and trends in service procurements are missed in the book. Prasad and Ramki has extensive experience with SAP SRM and it clearly shows in the coverage of SRM components and functions. They have covered Sourcing, Operational Procurement, Supplier Self Service, Contract Management, Catalogue Management, Invoicing, Workflow, and Analytics functionalities. The authors then went on to detail out config and settings required to setup these areas. The book ends with important FAQs, troubleshooting tips, and important SAP notes. Usually it is very difficult to understand configurations and technical settings without understanding context and relevance for these settings. Prasad and Ramki resolve the challenge by using case studies to provide context. For example, Besttec Industries is used to explain how organization structure should be configured. In case study method, it is better if alternatives are discussed before arriving at final solutions. This is missed for most part in the book. However, it does not significantly affect understanding the context and relevance. The best part of this book is how different scenarios are explained with flow chart and document flow. A quick reading of the chapter on scenarios will clear all doubts about different scenarios, and will help in selecting the scenario in specific client situation. In summary, I highly recommend this book to all functional and technical consultants implementing and supporting SAP SRM. This book will be useful to both new and experiences consultants. While this book will provide some value to business users, and other project team members, it is not primarily focused on them. I feel they will enjoy and benefit from first few chapters, but the book gets quite technical in later chapters, so they will not be able to engage with a major part of Consultant's Guide to SAP SRM .